Dinosaur tracks preserved in rocks are the fossilized remains of any behavioural activity of the living animal. Thus, in the case of dinosaurs, they may be the imprints of their feet on the substrate, the outline of their body as they lay on the ground, or the drag mark of a tail. We may also find more peripheral things such as skin imprints, nests, or even eggs. These tracks and traces are valuable indicators of the animal’s actual body shape, particularly with respect to their feet, since bones are just the skeletal support and generally lack the soft tissue. In any one day an animal may potentially make thousands of footprints (in one normal working day I made 5243 footsteps!). But of course few will be preserved. The simplest scenario for track formation is for an animal to make an impression on a yielding substrate (such as mud) and leave a negative imprint (mould) on the surface. This would later be infilled with a layer of sediment, such as sand. After lithification (hardening) and wearing away of the mud (now mudstone) the resulting print would be a positive cast on the underside of the (now) sandstone. Other sediment types and more complicated processes may be involved — but the principle is essentially the same. If the print is buried and preserved without modification by later water or wind currents this type of print would produce the most accurate representation of the foot shape, so-called elite prints which are not modified or superimposed by later prints (Lockley & Hunt 1995). Variations of the process include underprints and transmitted prints (Thulborn 1990; Romano & Whyte 2003). Both of these types result in prints which usually show less detail than elite prints, or in the case of the transmitted prints even exaggerate the foot size. How do we recognize whether or not these hieroglyphs in the rocks are dinosaur prints? Most bipedal dinosaurs (those that habitually walked on two legs) had three functional toes. If there were other toes, these rarely made marks in the sediment as they were too small or too far above the ground. So any mark in the rocks with three radiating imprints are good candidates. We can take this further. If the three digit imprints are quite strongly divergent, pad-like, and lack well-marked claw imprints then the tracks are probably representative of a herbivorous dinosaur (such as iguanodontids or hadrosaurs). Less divergent, slimmer digit imprints with distinct claw marks indicate a carnivorous type (the ‘raptors’ of Jurassic Park). By applying work done on living animals we can also estimate the hip height of these bipeds. Using the formula h = 4FL, where h is hip height and FL is footprint length, we can estimate the size of the animal. Although this is a useful first approximation, other estimates of hip height for bipeds have varied from 4.5 to 5.9 times the footprint length. 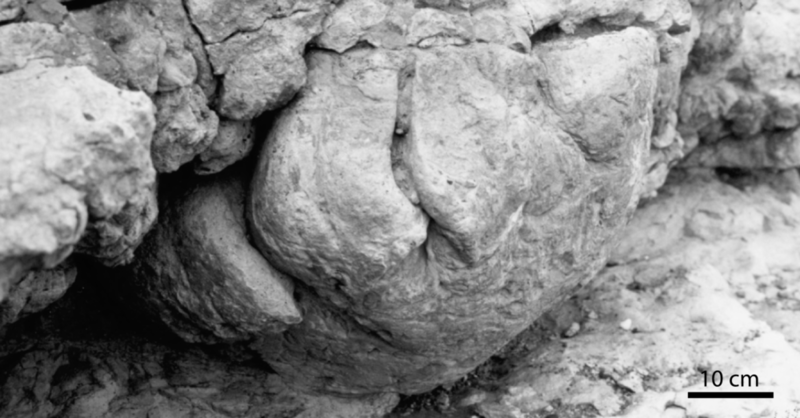 Sauropod pes (hind foot) from the Middle Jurassic of the Yorkshire coast, England. Quadrupedal dinosaur tracks tend to be dominated by prints of the giant sauropods Diplodocus and Brachiosaurus. These prints, often up to 1 m across, are subrounded to subtriangular in outline, often with 3 to 5 short toe digits. However, size is not absolutely critical in determining whether the structure is a print, since animal types and ages result in a wide range of print size. As with body fossils, we apply names to distinct print shapes, based on the binomial Linnaean system we adopt for modern and fossil animals and plants. Understandably there is some opposition to this system, since we are dealing with traces not organisms and one animal may make a number of different traces (depending on whether it was running, crawling, or even jumping), each with a different name. To clarify the distinction between species and trace fossil names, we prefix the latter with ‘ichnos’ (from the Greek meaning track or trace) with each name consisting of an ichnogenus and ichnospecies. Finally it is a fact, though perhaps initially bemusing, that although dinosaur tracks may be extremely abundant in the fossil record, they are usually not associated with the remains of the maker’s bones. This is also true of tracks and trails of other vertebrate, and indeed invertebrate, animals. Sufficient to say that, in the case of dinosaurs that lived in terrestrial environments, the conditions were not conducive to their skeletons being preserved in the fossil record. So, in the absence of bones, the answers lie in the tracks. Lockley, M and A Hunt (1995). Dinosaur tracks and other fossil footprints of the western United States. Columbia, 338 p.
Romano, M and M Whyte (2003). Jurassic dinosaur tracks… Proceedings of the Geological Society of Yorkshire, 54, 185–21, DOI 10.1144/pygs.54.3.185. Thulborn, T (1990). Dinosaur Tracks. Chapman and Hall, London, 410 p.
Mike Romano graduated from the University of Liverpool with a PhD on the Ordovician rocks of eastern Ireland, with an emphasis on the trilobite faunas. He then went on to lecture in the geology department at Sheffield University. This was followed by research into the Ordovician rocks and trilobite faunas of Portugal where he became interested in invertebrate trace fossils. It was then a natural transition into work on the dinosaur tracks of the Middle Jurassic of Yorkshire. He retired as senior lecturer in 2006, but still retains an active interest in tracking Yorkshire dinosaurs.